The “severely disfigured” bodies of five sailors were recovered Friday from the submarine which sank here Wednesday with 18 men. The navy declared that finding any survivor was unlikely. The five bodies were found by naval divers from the 2,300 tonne INS Sindhurakshak, which was recently refurbished in Russia and which suffered explosions and fire as it went down after Tuesday midnight. “Efforts to trace and retrieve the other 13 bodies of sailors are underway on a war footing and we are hopeful of further recoveries by late this evening,” an official said. These five were among the 15 sailors and three officers who got trapped in the submarine berthed at the Mumbai dock once disaster struck. Eight of the sailors were married. The bodies were sent to the government-run Sir JJ Hospital for autopsy, DNA and other tests to ascertain their identity. The search operation has slowed down as only one diver can work at a time owing to the cramped space inside the submarine. Also, all equipment in the deep sea fighter vessel has shifted from theiroriginal location. The navy said “the state of (the bodies) and conditions within the submarine leads to the firm conclusion that finding any surviving personnel is unlikely. “The damage and destruction within the submarine around the control room area indicates that the feasibility of locating bodies of personnel in the forward part of the submarine is also very remote as the explosion and very high temperatures, which melted steel within, would have incinerated the bodies too,” the statement added. The bodies extricated from the submarine “are severely disfigured and not identifiable due to severe burns”, the navy said, adding they have been sent to INHS Asvini, the naval hospital, for possible DNA identification. This “is likely to take some more time”. 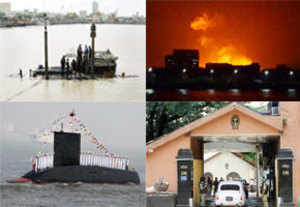 It said the boiling waters inside the submarine prevented any entry till Wednesday noon. “Access to the inner compartments of the submarine was made almost impossible due to jammed doors and hatches, distorted ladders, oily and muddy waters inside the submerged submarine resulting in total darkness and nil visibility … even with high-power underwater lamps. “Distorted and twisted metal within very restricted space due extensive internal damage caused by the explosion further worsened conditions for the divers. “This resulted in very slow and laboured progress,” the statement said. After hours of “continuous diving effort in these conditions”, navy divers finally reached the second compartment behind the conning tower early Friday. The navy said it was concentrating on reaching the interiors of the submarine to “locate and extricate any remaining bodies that may still be trapped within”. “Salvage of the submarine would only be attempted thereafter for which many alternatives including deploying professional salvers are also being considered. “However, presently, gaining access to the submarine and locating bodies is the top priority,” the navy said. The heat of the explosion had melted parts of the internal hull deforming the submarine hatches, preventing access to different compartments. Heavy duty pumps were used to pump out the seawater from the submarine. The families of the 18 personnel were being provided regular updates. The navy feels that some of the armaments inside the deep sea fighter vessel, stored on the rear side may be recovered undamaged as the flames did not completely gut that portion of the submarine. This entry was posted in The world's submarines and tagged India, INS Sindhurakshak, Submarine, tragedy on August 17, 2013 by jasonlockley. New Delhi: In a major step towards completing its nuclear triad, India activated the atomic reactor on board the indigenous nuclear submarine INS Arihant, paving the way for its operational deployment by the Navy. “The nuclear reactor on board the INS Arihant has been made critical (activated) last night,” sources said on the development of the nuclear submarine. Nuclear triad is the ability to fire nuclear-tipped missiles from land, air and sea. After the nuclear reactor is activated, the agencies concerned can work towards readying the warship for operational deployments soon. The nuclear submarine will help India achieve the capability of going into high seas without the need to surface the vessel for long durations. Conventional diesel-electric submarines have to come up on surface at regular intervals for charging the cells of the vessel. The orange beacon atop the conning tower came to life on July 26, 2009, as Prime Minister Manmohan Singh’s wife Gursharan Kaur had pressed the button to symbolise the launching of the vessel into water. In the middle of the body – comprising an outer hull through which the water goes in and an inner pressurised hull – on the starboard side are two rectangular vents, meant to take in water when the vessel dives into the sea. It is like a “cocoon within a cocoon”, an official had explained. INS Arihant is longer than any of the submarine in the Indian Navy’s fleet so far. A nuclear submarine is powered by a nuclear reactor, which generates tremendous heat driving a steam turbine. It has unlimited underwater endurance and speed twice that of its conventional counterparts. The submarine can carry 12 nuclear missiles K-15. Keeping in line with its “no first use policy”, the submarine will help India in developing a “credible second strike capability” in case of nuclear attack, said officials. 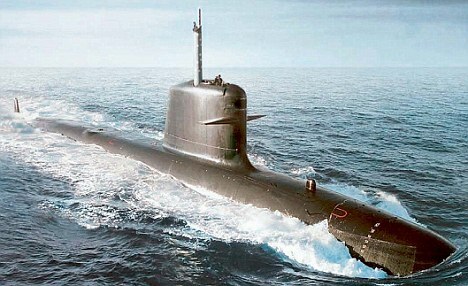 The Indian Navy has been operating conventional diesel-electric submarines, which have to surface to charge their batteries. This entry was posted in The world's submarines and tagged BO-5, DRDO, India, INS Arihant, Submarine, Vishakhapatnam on August 10, 2013 by jasonlockley. India’s submarine INS Sindhurakshak received help from Egyptian Navy when it encountered extreme bad weather and rough sea on its way back home after mid-life up-gradation in Russia. The Sindhurakshak, a Russian Kilo Class submarine built in 1997 at Admiralteiskie Verfi shipyard in St Petersburg, underwent mid-life up-gradation. The Egyptian Navy towed the submarine to Port Said along the coast of the Mediterranean Sea in March, sources said. Welcoming the gesture, Indian ambassador to Egypt Navdeep Suri praised the professional handling by the Egyptian Navy. In thank you cable to Egypt’s Defence and Military Production Minister Gen Abdel-Fattah el-Sisi, Suri said, “(Egyptian) Naval troops towed the submarine in a professional way to a safe Egyptian port”, the official MENA news agency reported. This entry was posted in The world's submarines and tagged Egypt, India, INS Sindhurakshak, Kilo Class, Submarine on May 27, 2013 by jasonlockley. INS Vagli, the oldest operational submarine of the Indian Navy, was handed over to the State government on Wednesday to be converted into a maritime museum that will be established at Mamallapuram. Vagli, decommissioned in Visakhapatnam on December 2010, arrived here on March 25. It was handed over to State Finance Minister O Paneerselvam and Tourism Minister P Chendur Pandian by Vice-Admiral Anil K Chopra, Flag Officer Commanding-in-Chief, Eastern Naval Command. The submarine is likely to be stationed in harbour till September before being transferred for installation on about 30 acres of land abutting the beach near the Shore Temple, a UNESCO world heritage site. Chopra said that the submarine was towed to Chennai port free of cost. Paneerselvam thanked the vice admiral and sought his help in installing the submarine on at the selected site. The ship, which will be converted into a museum, will have food courts, audio-visual studio, souvenir shops and an aquarium. It will be planned and executed in a phased manner using the ‘build-own-operate-transfer’ model. The Vagli, a Type 641B Foxtrot-class submarine, was commissioned by then Lieutenant Commander Lalit Talwar on August 10, 1974 at Riga, Latvia, in the erstwhile Soviet Union. It had completed 36 years of dedicated service under 23 commanding officers. INS Vagli, the oldest operational submarine of the Indian Navy undertook her last dive. The submarine is scheduled to be decommissioned in December after 36 glorious years of service. Vice Admiral Anup Singh, Flag Officer Commanding-in-Chief, Eastern Command along with other senior officers sailed on the submarine to mark the historic occasion. In his message on the occasion, the Flag Officer commended the crew for their professionalism and enthusiasm and said that the submarine had sailed into history with pride and honour. The submarine, presently commanded by Cdr AA Kapre, is the last of the Foxtrot class of submarines which were built in the erstwhile USSR. She was commissioned on August 10, 1974 at Riga and since then has operated extensively on both the coasts. The submarine has participated in large number of exercises with ships and aircraft including recently concluded bilateral exercise with the Singapore Navy. This entry was posted in The world's submarines and tagged Foxtrot class, India, Indian Navy, INS Vagli, Type 641B on April 11, 2013 by jasonlockley. The navy is still awaiting defence ministry’s approval for inviting bids for the new line of six submarines despite indications that all the stumbling blocks in the way of the crucial project have been cleared. Navy chief admiral DK Joshi had even announced in December last year that the request for proposal (RFP) for the submarines were on the way “very soon”. Sources said the ground work has been completed by the navy, and it has sent the proposal to the defence ministry for final approval. The project, named 75-India, is crucial to augment navy’s under water capabilities which has taken a hit because of delays in finding replacement for the existing fleet of ageing German and Russian submarines. It was expected that the RFP would now be issued only in the next financial year beginning next month. The navy had shown sense of urgency in getting necessary approvals as the massive projects needs to get underway without further delays. The navy is looking to have Air Independent Propulsion (AIP) system in the new line of submarines, which will provide the capability to sustain under water longer decreasing the possibilities of detection. The AIP systems have become crucial feature of conventional diesel electric submarines but at the moment, Indian fleet lacks the capability. Even the under construction French Scorpene submarines would not have this feature. The modalities for the construction of the new line were debated upon. It was felt that two submarines should be purchased directly from a foreign vendor while the two would be constructed at Hindustan Shipyard Limited (HSL) in Vishakhapatnam and the remaining at Mazgaon Dock Limited (MDL) in Mumbai. 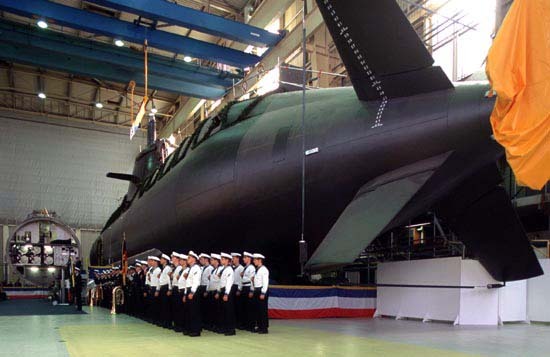 It was argued that the HSL had no experience of building submarines while MDL has the capability because of the ongoing construction of French Scorpene submarines in the shipyard. The distribution of work among the shipyards for the new line has been the biggest point of contention so far. Navy chief’s announcement about the RFP being floated very soon had indicated that issue had been sorted out. This entry was posted in The world's submarines and tagged 75-India, AIP Propulsion, India on March 4, 2013 by jasonlockley.